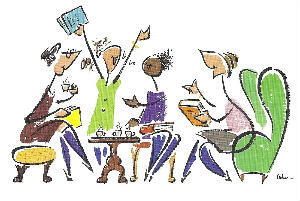 This informal group meets roughly every half-term to discuss a particular book and they try to choose a wide variety of books - contemporary and classics, fiction and non-fiction. They avoid heavy literary discussion, and the emphasis is usually on the issues raised by the books – such as the north/south divide in ‘Pies and Prejudice’, ethical dilemmas in ‘The Sunday Philosphy Club’, or attitudes to life and death in ‘Ways to Live for Ever’. This is not a club, so if you would like to come along just read the book beforehand! Details of the current book and the date of next meeting are in the Notice Sheet. See Ann for more details.